Poker is among the most popular casino games in the industry, and with more and more new players showing up online and in brick-and-mortar casinos. But poker is a game of skill, with poker Player Rankings and seasoned players holding a big advantage when sitting at the table with the lesser-skilled opposition. Those games go by pretty quickly and aren’t that enjoyable for those trying their hand at poker for the first time. It’s simple, quick, fun, and the game does most of the heavy lifting for you. Video poker can be found at just about every online casino, Vegas floor, and various bars and restaurants, and is a great way to learn about valuable poker hands and how to grade them. Video poker doesn’t have players going head-to-head with others, rather it asks them to make the best poker hand with the cards dealt by selecting which cards to toss or keep, drawing one round of new cards to then make the final hand. Each hand has a value, and the more difficult hands to make pay out more. Certain variations of video poker assign “wild card” value to particular cards, such as “Jacks” or “Deuces” and those can be in turn used to fill in gaps in high-paying hands. It’s a solo game that you can play at your own pace or while doing something else, like watching the football game at the bar. This is probably the most basic variation of poker and a nice graduation from video poker for new players. The same hand grading applies to stud poker, but when playing in a casino setting, you are facing a dealer rather than other players. You place your wager before five cards are dealt, then you have the option on tossing or keeping cards once you get your hand, receiving replacements for the number you tossed away. Then – depending on the rules – there is another round of betting, before the cards are shown. If the player has a higher-graded hand than the dealer, than they win. Simple enough. This is another variation of poker that allows new players to face the dealer directly and not have to play against others head-to-head. Pai Gow is a nice intro game to different types of poker and the pace is very leisurely, with plenty of pushes allowing players to enjoy a lengthy session without breaking the bank. Pai Gow deals seven cards to the dealer and player (after bets are placed) and they are asked to make their best two poker hands from those cards: the front hand consisting of two cards and the back hand consisting of five. 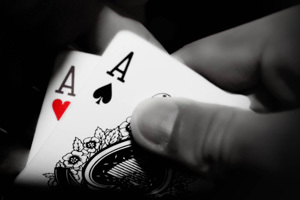 In order for the player to win, they must beat both of the dealer’s hands. If the two split hands, the game is ruled a push and bets are returned.